This chart displays the “power” features of wi-fi video doorbells. It is a chart that shows the most important features of these doorbells. In this first chart, I outline the most important differences between these doorbells and this camera. This is for all of you out there who are in a rush and just want the main headlines. To start this section off Let’s state two things that are obvious. Three of these devices are doorbells and one of them is at camera and so they do not share all of the same features. But because they are all made by the same company, they do share a lot of the same features- features that have the same specifications. 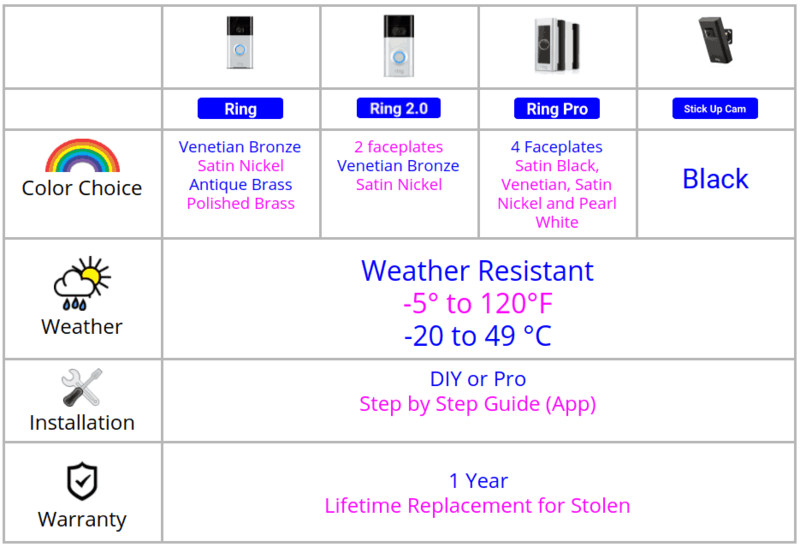 There are seven different features where these ring products show important differences. In terms of resolution, the Ring 2.0 And the Ring Pro record footage at 1080p. The Ring and the Stick Up Cam record footage at 720p. The Ring doorbell has a field of vision of 180 degrees. The Ring Two And The Ring Pro have a field of vision of 160 degrees and the Stick Up Cam has a field of vision of only 80 degrees. The Ring and the Ring 2.0 doorbells can be operated by low voltage doorbell wire or via a rechargeable battery. The Ring Pro can only be powered by low volt voltage doorbell wire and the Stick Up Cam can be powered either through a rechargeable battery or using a solar panel. Looking at the different colour options, when you buy the Ring doorbell it is available in four different colours. The Ring 2 doorbell comes with two face plates that are different colours. The Ring Pro comes with 4 different colored face plates and the Stick Up Cam is only available in black. The Ring, Ring 2 and the Stick Up all connect to your home Wi-Fi router that operate at 2.4 gigahertz. The Ring Pro connects to Wi-Fi routers that operate at a speed of 2.4 gigahertz or 5 gigahertz. These final two features are both subject to change; they are overall Amazon rating and price. Looking at the overall Amazon ratings, the Ring, Ring Pro and Stick Up Cam all have an Amazon rating of 4.1 out of 5 where as the Ring 2 has a rating of 4.3 out of 5. 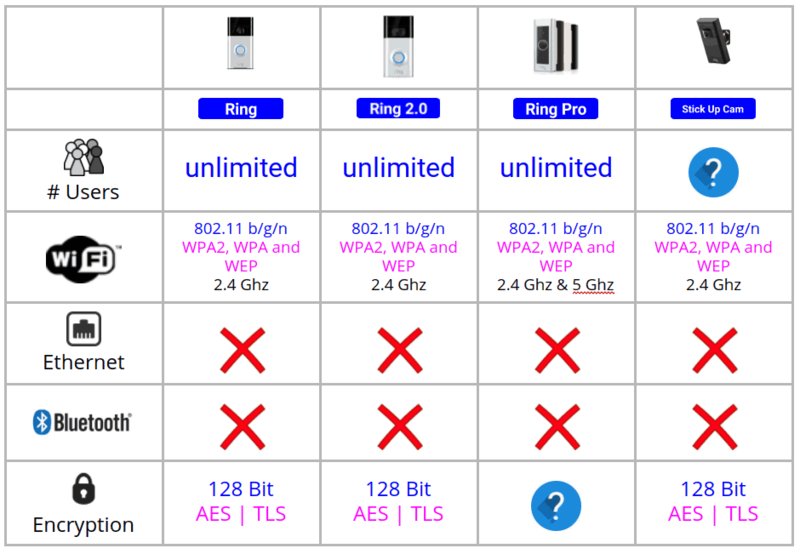 The Ring Pro is the most expensive of all of these devices and at the moment costs $249. 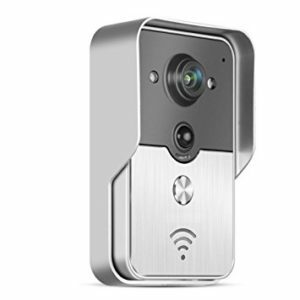 The Ring 2 and the Stick Up Cam both cost about $200 and the original Ring doorbell currently costs $179. Now that the main differences have been highlighted, let’s move on to a much more detailed comparison. In this section I compare some of the basic features of these smart doorbells. All four of these devices are made by the same manufacturer, Ring. Ring was created in 2012 by James Siminoff. Up until this year it only made Wi-Fi video doorbells, but the stick up cam is its first smart security camera. The original Ring doorbell is the oldest product and that was launched in August 2014. The newest product is the Ring 2 doorbell which was launched only a couple of months ago in June 2017. The Ring Pro was launched in April 2016 and the Stick Up Cam was launched in February 2016. The original Ring doorbell ,which is the oldest product, is also the heaviest and it weighs 16 ounces. The largest of these devices is the ring 2 doorbell and the smallest of these devices is the original ring doorbell. but in all honesty they have very similar dimensions. They all have very similar dimensions. And the final feature is the price. Obviously prices are subject to change. 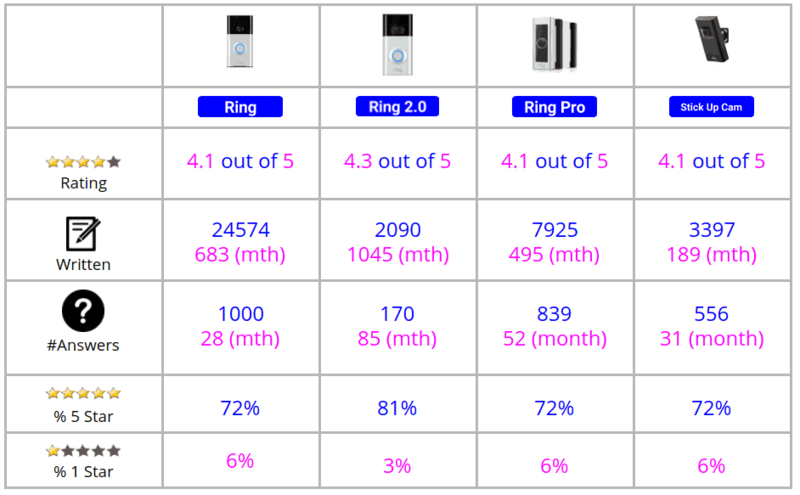 the ring pro doorbell is the most expensive device at $249 the ring 2 and the stick up cam had a very similar price around $200 and the original ring doorbell is the cheapest at $179. In this section I compare some of the smart video features of these doorbells. All of these Ring gadgets have night vision. And the only information I could find out about the night vision was that it can see clearly up to 9 metres or 30 feet! It was a real battle trying to find any more details about the night vision specifications. I believe that the Ring 2.0 uses 6 LEDs and the Ring Pro uses three LEDs for its night vision but I couldn’t find any information about how many LEDs the original Ring or the Stick Up Cam have. None of these devices use facial recognition technology but all of them have motion detection. The motion detection capabilities include setting up specific zones within the camera’s field of vision. And the ability to adjust the sensitivity of the detection within the zones. If any motion is detected then you will receive email alerts and push notifications. Ring alerts are when you are notified via the app if anyone presses the button. The three door bells in this comparison all have ring alerts. When someone presses the doorbell the app will let you know. Of course, the Stick Up Cam does not have ring alert because it is not a door bell! Finally in the smart video features section, all of these devices allow you to “live stream”. 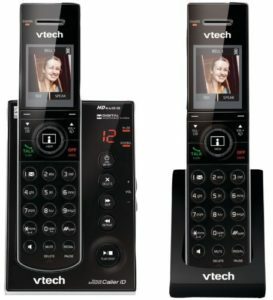 Live streaming is when you connect to your doorbell or your camera via the app and watch the video and listen to the microphone live. However, it is important to note that the original Ring doorbell and the ring 2 doorbell will not live stream if they are being powered by battery. This is because live streaming uses too much power for battery to cope with. The original Ring doorbell on paper has the best field of vision at 180°. The Ring Two And The Ring Pro have a field of vision 160°. the Stick Up Cam has a field of vision which is only 80°. Other top smart security cameras such as the Arlo Pro and the Nest Outdoor have fields of view of around 130°. And so the Stick Up Cam is poor in comparison. 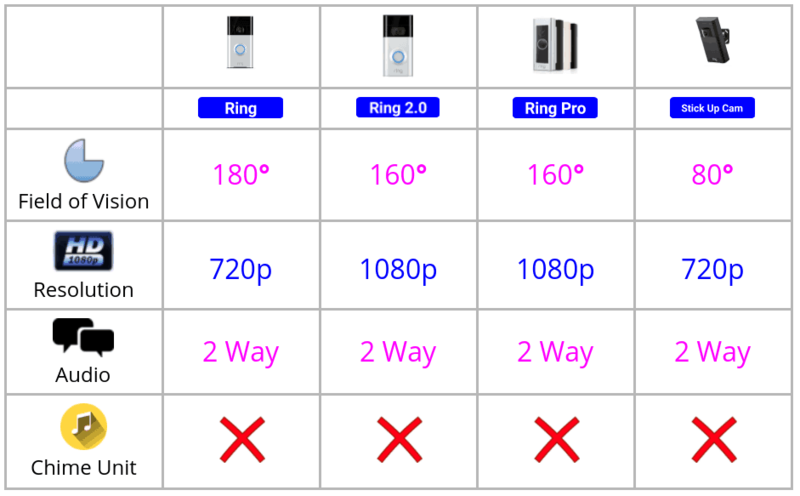 In terms of resolution, the Ring 2.0 and the Ring Pro both record footage at 1080p whereas the original Ring doorbell and Stick Up Cam record footage at 720p. Only a few Wi-Fi video doorbells record video at 1080p. But many smart security cameras record footage at that resolution. 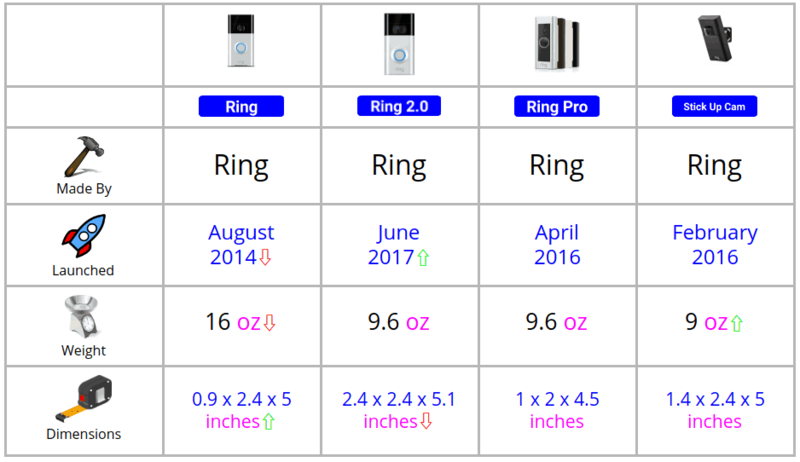 All of the Ring devices in this comparison have 2 way audio. This means that you can have a conversation with someone who is next to the doorbell or the camera via the app on your smartphone or smart tablet. None of the doorbells in this comparison come with chime units. A chime unit is a speaker that you have inside your house that plays a tune when the doorbell is rung. You can buy a chime unit for any Ring doorbell. Interestingly it is Wi-Fi video doorbells at the cheaper end of the scale that tend to include a chime unit in the original purchase. I think that the different power needs of these devices are quite difficult to get your head around! The Original doorbell the Ring 2 doorbell and the Stick Up Cam all have built-in rechargeable batteries which they can be powered from. Three of these doorbells come with power leads. For two of the doorbells, these leads are only to be used to recharge the batteries and should not be connected permanently to the doorbells to provide ongoing power. The Stick Up comes with a power lead which can be used to re charge a flat battery as well as providing ongoing power. The Ring Pro does not come with a power lead. Three of the devices in this comparison can be powered by doorbell wire. This is the low voltage wire which has traditionally been used to power doorbells. It is the only way that the Ring Pro can be powered. The Pro comes with a “Ring Power Kit” that needs to installed in order to make sure that it works properly. This is an incredibly innovative way to power a smart product and it will be interesting to see in the coming months if solar panels are used more widely. In this section I examine the storage options for these devices . Moving on to storage, the only way that video footage can be stored with any of these Ring products is by using Ring’s cloud storage system. None of the storage plans are compulsory. The doorbells and camera in this comparison will still work if you don’t subscribe to the plans but in a more limited way. The plans and the prices are the same for each device. Basic Plan. This is $30 per year per device. Protect Plan. This is $100 per year for an unlimited number of devices. Cloud storage is the most common form of storage for Wi-Fi video doorbells and security cameras. In this section I dig a little deeper into features relating to connections. let’s have a look at the number of users or more precisely the number of different phones that can connect to each of these products. This is an important quality because the more people that can connect to the device the more people that can use it. If for instance a doorbell can only connect to One phone then potentially only one person can answer the doorbell which is not very practical. I guess the flip side of this is that if too many people can connect to the doorbell or to a camera then it may make things less secure. the original ring doorbell ring 2 doorbell and the ring pro can all have an unlimited number of phones that can connect to them. I could not find any information about how many devices can connect to the ring stick up cam. All of these ring devices connect to your home wifi using the same procedures and standards. in terms of Wi-Fi forget all that technical jargon in the boxes, essentially all of these devices will connect to your Wi-Fi router. the only site difference is that the Ring Pro can connect two routers which are running at two speeds 2.4 and 5 gigahertz. none of these devices use ethernet or Bluetooth to connect two other devices or two other networks. thinking back to cloud storage, the strength of encryption that all of these devices use as your videos are transferred to the cloud is 128 bit. this is the same standard that banks use. In this section I compare features relating to design, installation and warranty. The original ring doorbell comes in one of four colours which you select before you buy. Those colours are;  Venetian bronze  satin nickel,  antique brass and  polish brass. The Ring 2 doorbell comes with 2 different colour face plates, which once you have installed the doorbell, you can swap to your heart’s content. The colours are; venetian bronze and satin nickel. Again once installed these face plates can be changed whenever you fancy. Disappointingly, perhaps, at the moment the Stick Up cam is only available in Black. All of these devices are weather resistant which is totally appropriate because they should all be placed outside. What is a little strange is that none of them have an official IP rating. IP stands for ingress protection and it is an industry wine rating that shows how protected a product designed to be used outside is against the elements. All of these gadgets can operate in temperatures that range from – 20 to 49 ° C, which converts to -5 to 120 ° F.
Looking at the installation requirements for these products, they can all be installed by people with a good basic grasp of DIY. Ring have developed some very precise step- by- step written instructions and video tutorials to help with the installation. All of these products come with a one year limited warranty and lifetime replacement warranty. This lifetime warranty applies to any device which is stolen. You will be sent a new device if you send Ring a copy of the police report outlining the burglary. If you opt for the “Protect” cloud storage plan,which was mentioned earlier, this extends your warranty on all of your devices to a lifetime. Ring Pro vs. August Doorbell Cam- Has The Ring Pro Met It’s Match? !